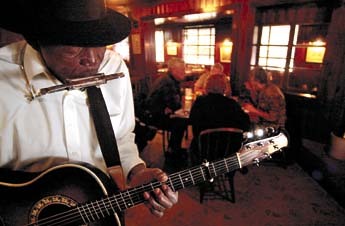 While you are enjoying your meal at The Yearling Restaurant, be sure to check out Willie Green! Hailing from Alabama, Willie delivers authentic down home blues at The Yearling daily. He has been called "The Real Deal" by slide guitar legend John Hammond, and has played with many of the greats. You can buy one of Willie's CDs or Tshirts while you're here, and get them signed if you like. Stop in and say hello, you'll hear some pickin' and some blowin' on that harp and you might even hear a story or two! Listen and you will hear the past come alive.